Today I am going through everything you will need to go back to school, college or University! Now is the time of the year when you will be going out finding all of your stationery items ready to go back to education in less than a month and it's probably one of the most exciting times when preparing for school, college or University. I found that stationery can automatically put me in a better mood when I am colour coordinating different aspects to the subjects I am studying or when you make a sentence stand out with bright colourful highlighters which are brand new. I found recently even writing my schedule into my diary can also be fun only because I'm using brand new pink pens which are so lovely to write with. So to my fellow stationery addicts, you will know exactly what I am talking about. Even if you don't go to school, college or even University, stationery items can still come in handy at some point in your life when you are trying to get your life in order. So let's get too it! Planners are definitely an essential for any student! or anyone at all! I am forever using a planner to jot down everything that is going on throughout each day to help me prepare for essay, blog posts or projects at University. It helps you to plan out your busy schedule stress free! Notebooks are the second essential for anyone. I use a notebook every day at University throughout lectures, planning my essays and jotting down anything important. I prefer to use the refill notebooks as you can easily tare out pages without ripping them in half in the process. Ring binders are a way of taking organisation to the next level. If you have a lot of notes from lectures or homework etc, the best place to organise it is in a ring binder to keep everything together and so you don't lose the most important parts of your project. Subject Dividers take organisation to the highest level. If you're not like me where you have a ring binder for every subject, you can use subject dividers to divide up your ring binders for each subject to keep everything in one place and organised. These are also great for general use at home when diving important document such as car insurance, home insurance, bills etc. Multi-purpose use! Sticky Notes I can never have enough of these! They are absolutely great if you want a page of notes to look bright and beautiful or if you want to cover your room in brightly coloured pieces of paper to help you revise for your exam. These are the best part of stationery check lists and I will always have these in my stationery collection. Pencil Case; a great home for all your colourful pens, pencils and markers. You don't want to have to rummage through your bag to find your pens and there are so many different pencil cases on the market. I personally prefer pencil cases which you can see through or the ones which are just too beautiful to touch. Hole Punchers, these are great if you don't want to use plastic wallets but need to secure all your important documents in your ring binder. You can find hole punchers in all different sizes, but my favourites are the tiny ones with either one hole or two. They're perfect to store in your bag because they're not too big. Highlighters I am one for colour coding everything and highlighting important aspects of a topic. Highlighters are an essential in my stationery collection and I use them for university and blogging too. Colleges and Universities highly recommend using highlighters to make them key points stand out. Small Notebook, although large notebooks are absolutely great for studying, small notebooks are perfect for when you're on the go and want to jot things down. This is also a fab tool for bloggers too! 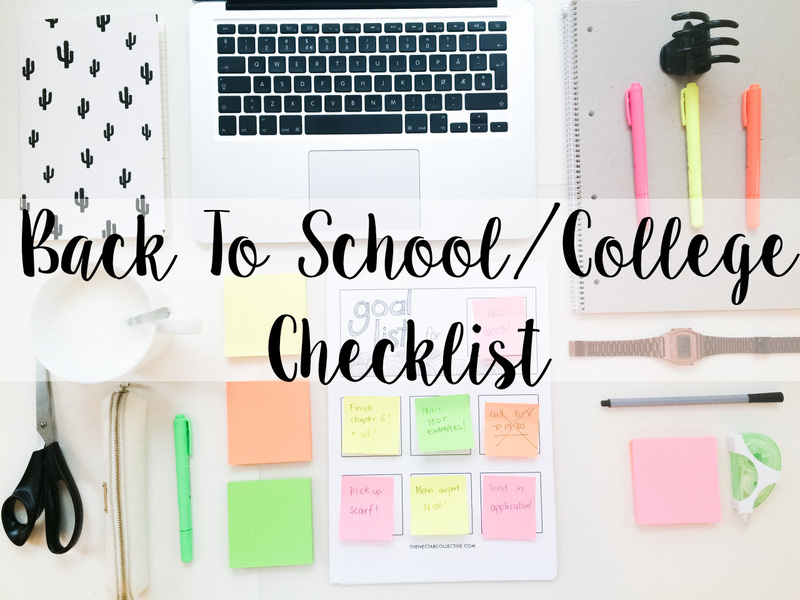 What's in your back to school checklist? Leave a comment, follow me on Bloglovin, tweet me your thoughts and ideas! It's good to be here jess, by reading your content, I can improve my english. I was a lazy student because I just showed up with my laptop. EEEEk! I always find planners work best for me! Even writing down the smallest things keeps everything in order for me! I was kind of dreading heading back to uni but this post actually makes me excited to get all my stationary together!! So not going back to any type of education any time soon, I am a stationery freak! Love love love it! Agree with it all, thanks for sharing, so useful to others!